Shows the North Carolina land grants that presaged the formation of Tennessee. A Map of the United States of America, with Part of the Adjoining Provinces from the latest Authorities. An unusual and ephemeral 1794 first edition map of the United States by Robert Wilkinson. Wilkinson's map covers the United States from the Mississippi River to the Atlantic seaboard and from the Great Lakes and Canada to Florida, which at the time was a Spanish possession. Beautiful original color work defines political regions. This map is most interesting for its treatment of western North Carolina and modern day Tennessee. In 1777 North Carolina took control of her largely unsettled western territories, which included all of modern day Tennessee, from the Crown and created a system of Land Grants by which to distribute these properties. The American Revolutionary War left state of North Carolina nearly bankrupt. Legislators in North Carolina looked to its already established land grant system to compensate is soldiers and raise money for the state budget. Virginia, which also claimed some of North Carolina's western lands also began issuing grants for the same territory. Various disputes ensued until, in 1786, two years after Wilkinson drew this map, the state of Tennessee was created. Tennessee's statehood forced both Virginia and North Carolina to give up their claims to the region, effectively turning over the Land Grant process to the Federal Government. Also of interest is Wilkinson's treatment of the western parts of the United States, including a vast Western Territory extending from western Georgia, around a proto-Tennessee, northwards as far as the Great Lakes, and eastward as far as Pennsylvania and Virginia. At the time this only tentatively explored region was dominated by various powerful and populous American Indian nations including the Choctaws, Muskogee, Chickasaw, Illinois, Miami, Cherokee, and others. Soon these lands would be organized by the Federal government into territories and eventually new states, a process which would eventually lead to the early 19th century displacement of the various indigenous peoples know as the Trail of Tears. Maine, far to the north, is identified as 'Belonging to the Massachusetts Bay.' Following the Revolutionary War Maine was treated as an enclave of Massachusetts. During the War of 1812 Massachusetts failed to protect Maine from British attempts to establish a colony there called New Ireland. Though the British were ultimately driven out, the failure of the Massachusetts militia led to general bitterness towards Massachusetts and calls for Maine's statehood – which were answered in 1820. 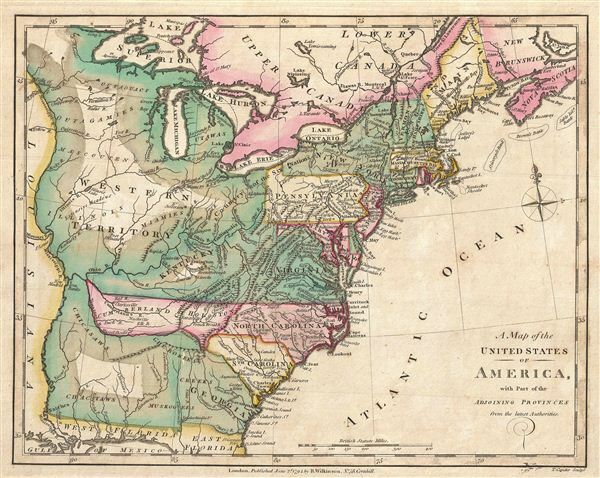 This colorful map was published in 1794 by R. Wilkinson of no. 58 Cornhill, London for issued in the first edition of Wilkinson's General Atlas.